Xiaomi Redmi 3S Prime comes with a full metal magnesium alloy unibody design and fingerprint scanner placed at the back below the camera. 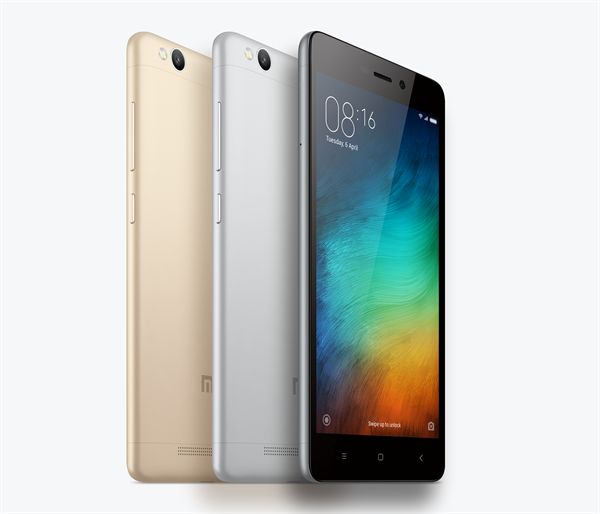 The Redmi 3S Prime flaunts a 5-inch HD (720p) display, and is powered by a Snapdragon 430 octa-core chipset Read More.. Description Xiaomi Redmi 3S Prime comes with a full metal magnesium alloy unibody design and fingerprint scanner placed at the back below the camera. The Redmi 3S Prime flaunts a 5-inch HD (720p) display, and is powered by a Snapdragon 430 octa-core chipset paired with 3GB of RAM. On the camera front, the device sports a 13-megapixel rear camera with LED flash, phase-detection auto-focus, and a 5-megapixel front-facing camera. The Redmi 3S Prime will be available in dark grey, silver and gold colors option. Xiaomi Redmi 3S Prime comes with a full metal magnesium alloy unibody design and fingerprint scanner placed at the back below the camera. The Redmi 3S Prime flaunts a 5-inch HD (720p) display, and is powered by a Snapdragon 430 octa-core chipset paired with 3GB of RAM. On the camera front, the device sports a 13-megapixel rear camera with LED flash, phase-detection auto-focus, and a 5-megapixel front-facing camera. The Redmi 3S Prime will be available in dark grey, silver and gold colors option. No reviews available for #Redmi3SPrime, Do you know Xiaomi Redmi 3s Prime?, Please add your review and spread the good things. Xiaomi launched the Redmi 3S and the Redmi 3s prime. This is the Redmi 3S Prime review, there is not much of a difference between the Redmi 3S and the 3S Prime, apart from the price, RAM/ROM and fingerprint sensor. In terms of design. there is very little to differentiate between the Redmi 3s Prime and the Redmi Note 3. If you ignore the difference in the placement of the front facing camera and sensors on top of the display or that of the rear camera and flash, it is pretty much a compact version of the Redmi Note 3. The metal body is curved at the edges, which makes it quite slippery but the compact size ensures that it fits well in the hand. Xiaomi had made a big deal about it in the redmi note 3 but somehow forgot about it in the Redmi 3s Prime. Having said that, there is no doubt that the Redmi 3s Prime is one of the most premium smartphones in the sub-Rs 10,000 price bracket, just like the Redmi Note 3. The speaker grille is at the bottom of the back. The physical buttons for volume and power are on the right, while the hybrid SIM slot is on the left. The phone accepts one Micro-SIM and another Nano-SIM or microSD card for storage. Unfortunately, this means that users will have to choose between a second SIM and a microSD card. Under the hood, the Redmi 3S and Redmi 3S Prime both pack the octa-core Qualcomm Snapdragon 430 (MMB29) processor, with four cores clocked at 1.1GHz and four cores at 1.4GHz, plus an integrated Adreno 505 GPU. Apart from the fingerprint sensor, the only differences between the Xiaomi Redmi 3S and Redmi 3S Prime are the amounts of RAM and storage. The Redmi 3S features 2GB of RAM with 16GB of inbuilt storage, while the Redmi 3S Prime has 3GB of RAM and 32GB of storage. The Xiaomi Redmi 3S Prime sets a standard for other smartphones in the same price band. We didn't face any lags while multitasking on this device, and there were no noticeable frame rate drops while playing games like Asphault. Apps loaded quickly and the screen responded to touches without any complaints. The only issue that we faced was occasional restarts while running benchmarks, which is a repetition of what happened during the review of the Redmi Note 3. There was no heating while charging the phone or talking on calls. The phone did heat up a bit while using the camera app, but it never became too uncomfortable to use. We encountered no issues while talking for long hours on the phone. The quality of sound through the speaker at the back of the handset was impressive, except that it went flat at maximum volume with no stereo effect. We did check the quality of music through our own wired earphones and we were not disappointed. There are plenty of tweaking options for music lovers. The camera is nothing worth writing home about either. The front facing 5-megapixel camera gives out grainy results under most lighting conditions. The rear 13-megapixel camera is slightly better, but it isn’t something that you would get printed. Well, who does that anyway these days. Photos in low light conditions are grainy again and even in good lighting come out to be soft when zoomed in. It seems good camera sensors haven’t yet percolated to entry-level smartphones. And that’s really a pity for smartphones like the Redmi 3s Prime.Camera quality is above average. The Redmi 3S Prime no doubt is a very good handset with a very good price tag, however it does not come with fast charging support and the Snapdragon 430 hardware is not as powerful as the Snapdragon 650 hardware redmi note 3 is using. Redmi 3S prime cannot play 4K videos smoothly, Redmi Note 3 can. Also when you compare the benchmarks there is a good difference. Having said that the 3S is still a very good buy, you will hardly notice any difference in performance with you daily usage though technically Note 3 is powerful.